wrote Longitude, which won the 1997 British Book of the Year award, and A More Perfect Heaven: How Copernicus Revolutionized the Cosmos. I awoke on the morning of June 5 in a bottom bunk of the ‘Monastery’ at the Mount Wilson Observatory in California. This small dormitory has housed a pantheon of astronomers over the past hundred years, including Edwin Hubble, whose private library survives intact behind a locked door at one end of the building. I had heard that the Monastery earned its name as a play on the surnames of its early inhabitants, Charles Greeley Abbot and Charles Edward St John, but, more likely, the term described the long-standing all-male dominion over the observatory — as over the whole science of astronomy. At daybreak, with the 2012 transit of Venus still ahead of me, I felt my night’s rest had won a symbolic victory for any woman ever denied telescope time or a bed on the mountain. I had observed the previous transit of Venus eight years ago, from the campus of an Italian university outside Rome, where I travelled in a large company of astro-tourists just to see it. This time, I had joined a congenial group of antique telescope enthusiasts, who I knew were already out at first light, setting up equipment hauled in vans and trailers up the tortuous mountain road. Today promised to grant us the privileged status of second-time Venus-transit viewers. We would not get a third opportunity. No mortal can witness more than two transits of Venus in a lifetime: the motions of the heavenly spheres permit only two per century. Most of the human family has never seen even one. 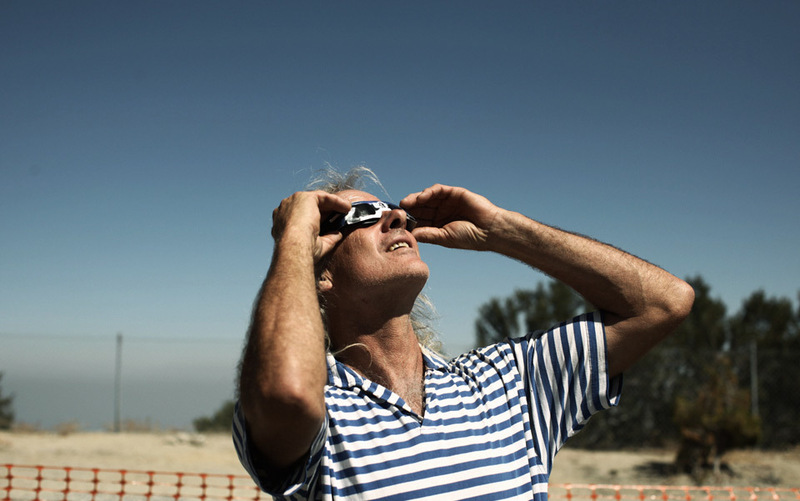 As spectacles go, the transit of Venus — the sight of the small planet passing across the face of the Sun — is not beautiful. Many everyday sunrise and sunset vistas surpass it. Yet Venus’s promise to reveal secrets of the universe during each brief transit has seduced generations of scientists to sacrifice anything for the sake of observing the rare event. In the 18th and 19th centuries, scores of men died in such pursuits. In the 20th century, no transits occurred. The next one will come, in its due course, on December 10, 2117. A transit transforms specific locations into destinations if they afford ideal viewing — no matter that they stand behind enemy lines in wartime or at frozen outposts normally deemed inaccessible. Adventurers past who chased planet Venus on her cross-solar trek braved dangers ranging from shipwreck in the North Atlantic to a fatal epidemic in Baja, California. All I had to do was board an aeroplane and hope for good weather. The 3,000 miles I travelled from my home in New York to the summit of Mount Wilson comes to about 1/31,000th the distance from the Earth to the Sun. I mention this because the average Earth-Sun distance of 93 million miles, so familiar a fact today, was originally determined by observing the transit of Venus. Without knowledge of the Earth-Sun distance no one could gauge the gaps between the planets, or grasp the enormity of the gulf separating the planets from the stars. Without knowledge of the Sun’s actual distance, one could not even begin to calculate its mass, diameter or true brightness. Precise modern measurements of the solar system have not rendered the transit of Venus obsolete to science. On the contrary, the 2012 event drew the attention of the Hubble Space Telescope, the Nasa Solar Dynamics Observatory, and the European Space Agency’s Venus Express orbiter. Findings from these and other ground- and space-based instruments will leap the bounds of the solar system, as astronomers apply them to the ongoing search for Earth-like exoplanets orbiting stars beyond the Sun. The 2012 occasion also drew the largest global audience in transit history. Thousands of day-trippers turned up at the Adler Planetarium in Chicago, the Griffith Observatory in Los Angeles, and other such centres of public outreach in astronomy. The more serious, or more affluent, boarded cruise ships to points in the Pacific Ocean, where they could count on clear skies and capture the transit in its entirety of six hours and 40 minutes. I knew that viewing the transit from Mount Wilson precluded my seeing its full duration. Sunset would intervene nearly two hours before the event ended. While diehard friends flew off to Hawaii, I convinced myself I could be content with the beginning and the middle at such a historic site. The Mount Wilson Observatory, high above the city of Pasadena, opened in 1904 for the express purpose of studying the Sun. Its research purview has since widened and many large and small telescope domes now dot the mountain, but the 150-foot solar tower dominates the site. At the tower’s top, movable mirrors (still adjusted by hand) track the Sun all day, every day, throwing down a live image to the control room at the base, where a bust of the observatory’s founder George Ellery Hale oversees the monitoring of sunspot activity. The parking lot assigned to our group as the transit encampment marked the very spot where Hale tested his first solar instrument in 1903. Had he somehow re-materialised on the mountain to watch the transit with us, he would have recognised a few of our 100-year-old instruments. And even the view through them. At the age of fourteen Hale observed the 1882 Transit of Venus, inaugurating a career of invention and discovery that made him the acknowledged ‘priest of the Sun’ in his day. Johannes Kepler, however, the German astronomer who made the first ever transit predictions in 1629, failed to see in life what he foresaw on paper. Kepler died the year before the transit of Venus took place, and in any case, the 1631 transit was not visible from Europe. Kepler’s studies of planetary motions in the early 1600s revealed the relative dimensions of the Solar System. He could say, for example, that Jupiter’s distance from the Sun was 5.2 times that of the Earth’s — whatever the Earth’s might be. Likewise, Venus’s distance from the Sun was a fraction of Earth’s (0.72), and Mercury’s an even smaller fraction. Given these relationships as a foundation, a single true value for any interplanetary distance would put real numbers on all the rest. In 1716, Edmond Halley, England’s second Astronomer Royal, proposed using the transit of Venus as a milepost. Halley got the idea while observing a transit of Mercury — a much more common phenomenon that occurs at least a dozen times per century. Although Mercury was too small and too close to the Sun for his purpose, Halley assumed Venus would serve. He proposed dispatching observers as far north and south as possible to view the next transit of Venus. Expeditionary groups must go where the entire event would be visible from start to finish. Northern and southern teams would see the same thing from different vantage points: Venus would appear to cross the Sun’s disk at different solar latitudes and therefore traverse the disk in different time spans. From those small differences between the reports, mathematicians could extract the crucial Earth-Sun distance — a quantity dubbed the astronomical unit. I strongly urge diligent searchers of the Heavens (for whom, when I shall have ended my days, these sights are being kept in store) to bear in mind this injunction of mine and to apply themselves actively and with all their might to making the necessary observations. And I wish them luck and pray above all that they are not robbed of the hoped-for spectacle by the untimely gloom of a cloudy sky; but that at last they may gain undying glory and fame by confining the dimensions of the celestial orbits within the narrower limits. Nearly two decades after Halley’s death, his idea launched a thousand ships. That’s an exaggeration, of course. But 120 hopeful observers followed his injunction, fanning out to 62 locations stretching from Siberia to the Cape of Good Hope. Even before this international effort to observe the 1761 transit got under way, the French astronomer Josef-Nicolas Delisle had refined Halley’s method to make it fail-safe. Rather than tracking the entire transit from near-polar positions, Delisle advised teams to spread around the globe and try to catch either the beginning phases or the end stages. Later, the results from all points could be pooled, matched to their precise locations, and then analysed to produce the astronomical unit. Disaster dogged many of the 1761 expeditions, given that much of the world was engaged in the Seven Years War. Thus Charles Mason and Jeremiah Dixon, sailing out of Portsmouth Harbor, bound for Sumatra aboard a Royal Navy frigate, were fired on by a French warship and forced back to port with heavy damages and a decimated crew. By the time they refitted and readied themselves for a second foray, they had no choice but to settle for a less favourable site in Cape Town, South Africa. 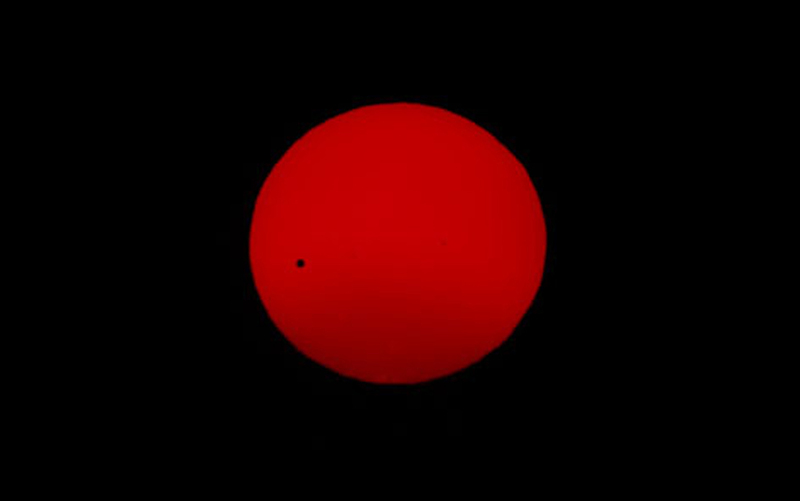 There, on June 6, and despite intermittent clouds, they succeeded in capturing the only accurate transit observations from the southern hemisphere. In northern Russia, Mikhail Lomonosov of the St Petersburg Academy of Sciences watched the same transit from his home observatory. He reported seeing a slender arc of light illuminate the outer limits of Venus as the planet entered and exited the Sun’s disk. This glow, Lomonosov said, proved that the planet possessed an atmosphere. The discovery fed his visions of living, breathing Venusians. Only later did the awful truth emerge about Venus’s atmosphere — the miles-thick blankets of poisonous gases bearing down on the planet with 90 times the Earth’s air pressure at sea level. Indeed, modern planetary science has revealed Venus to be a perfect theme park of Hell. Its landscape seethes with smouldering volcanoes and surface temperatures hot enough to melt lead. Nevertheless, the planet retains its ancient associations with beauty and femininity. Early skygazers probably conferred these attributes on Venus when noting how her visitations in the morning or evening sky lasted a significant nine months. And it was this long-standing link with romantic love that lured a local couple to ascend Mount Wilson with their friends and relations on transit day 2012 for a formal exchange of wedding vows. Two members of our astro-group also turned to thoughts of love. The pair had met eight years before in Boston, when they were brought together by efforts to ready a historic telescope — a veteran of 1761 — for a public viewing of the 2004 transit. As they knelt together on Mount Wilson to share an eyepiece at the start of the 2012 transit, he proposed marriage, and she accepted. In my own self-induced, pre-transit mania, I devoured most of Shirley Hazzard’s The Transit of Venus, her 1980 story of thwarted love, before realising that the title was a metaphor. The twentieth-century setting should have clued me right away that the novel could never involve a real transit, but one of the characters worked as an astronomer, so I kept hoping all the same. By page 167, where Hazzard showed her ignorance of transit dynamics by saying, ‘Venus can blot out the Sun,’ I was too enamoured of her prose to stop reading. Astronomers are just as liable to incline toward metaphor, describing the four key stations of Venus’s transit as ‘contacts’, although Venus and the Sun merely appear to touch each other across millions of miles of interplanetary space. At ‘first contact’, Venus’s body just kisses the Sun’s perimeter. ‘Second contact’ follows soon after, when the entire dark silhouette of the planet has fully penetrated the Sun’s disk. Hours then pass in transit before Venus’s leading edge encounters the Sun’s opposite shore for ‘third contact’. Over the final 20 minutes Venus emerges, until its ‘fourth contact’, or kiss goodbye. But first contact eluded the fellow at the telescope because Venus remained invisible in the Sun’s glare until she began denting the disk. And the all-important second contact proved unexpectedly difficult to judge, because Venus misbehaved. Instead of maintaining a perfect sphere as predicted, and perching like a pea on the rim of a dinner plate, she appeared to stretch herself into a teardrop shape, hanging on to the Sun’s limb by a thread, or blob, or a bridge of connective tissue. By the time this ‘black drop effect’ dissipated, the planet stood well within the Sun’s bounds, and it was impossible to say exactly when that had happened. Near third contact, Venus again elongated into a black drop, confounding attempts at precise reckoning. Guillaume LeGentil of the French Academy of Sciences suffered added hardship by attempting his observations at sea. He had departed from Paris in 1760, more than a year ahead of the transit, in order to allow time for all necessary preparations at his chosen site — Pondicherry, in southeast India. Storms, skirmishes, dysentery, and other difficulties delayed him en route, however, and as he finally neared Pondicherry he learnt the region had fallen to the British, preventing his landfall. Turning about in late May with hopes of reaching a fallback site on Mauritius, LeGentil found himself still aboard ship on the appointed day of June 6. At least the weather smiled on him: he saw the entire transit. But he did not observe it scientifically, since he could neither time the contacts nor ascertain his position. In 1761, mariners owned no means of establishing their longitude. Even on land, determining longitude demanded lengthy and painstaking astronomical observations. To that end, Mason and Dixon stayed on at Cape Town for a further four months after seeing the transit, to lock in the coordinates of their temporary observatory. A devastated LeGentil locked himself in his cabin after the transit and made no entries in his diary until the ship reached Mauritius more than a fortnight later. Rather than return to France in defeat, LeGentil, who had no loves or dependants expecting him at home, chose to wait in the Indian Ocean basin for the eight years until the next transit of Venus. The odd pattern of transit repetition — two within a decade, practically on the same date, followed by a hiatus of more than a century before another pair — was already well understood in LeGentil’s time. It results from the speed and slant of Venus’s orbit, which tilts about three degrees from the plane of Earth’s orbit. If the paths occupied the same plane, we would see a transit of Venus about every 18 months, whenever the speedier Venus overtook the Earth on its circuit of the Sun. But because the planets travel on crisscrossed paths, Venus usually skirts above or below the Sun (from an Earthling’s perspective). For a transit to occur, Venus needs to pass between the Earth and the Sun when both planets are near one of the two nodes — the points where the planes of their orbits intersect. Earth reaches those points of possibility every June and December. Sometimes Venus is there, lying right along the line of sight to the Sun, but more often it is not. If the first transit of a pair occurs in June, the second one does, too, while the following two will fall in December, 105 years later. After a pair of December couplings, 122 years elapse before a June reunion. During June transits, Venus descends from above Earth’s orbital plane to below, and so traces a down-sloping course across the Sun (from 11 to 3 on a clock face, say, or from 8 to 5). At December transits, with Venus on the upswing, the perceived path climbs. In the 1760s, throughout the eight long years of LeGentil’s inter-transit layover, he occupied himself studying the flora and fauna of Mauritius and Madagascar. As he explored, he drew improved maps of both islands. A dedicated natural philosopher in those pre-specialised times could make worthy contributions to several fields of science. Geography and weather conditions convinced LeGentil of Manila’s superiority as a base from which to observe the 1769 transit. However, the Spanish governor proved uncooperative, and LeGentil’s French superiors insisted he return to Pondicherry, which was once again French territory. With characteristic diligence, he arrived more than a year in anticipation, using the lead-time to pinpoint the coordinates of the old palace pavilion where he set up his instruments. After a full month of clear skies, June 3, 1769 dawned dreary. Pondicherry was socked in for 24 hours, and the transit obliterated. Even those blessed with clear skies found cause to lament, when they realised how the black-drop effect undermined their efforts. Captain James Cook and astronomer Charles Green, standing side by side in 1769 at Point Venus in Tahiti, each at his own telescope, called out values for third contact that differed by 12 seconds. Other teams fared worse, all failing Halley’s expectations of split-second concurrence. The 1761 results had narrowed the estimate of the Earth-Sun distance to between 77,100,000 and 98,700,000 miles — a margin of error of more than 20 per cent. The 1769 efforts reduced the distance discrepancy to about 4,000,000 miles, and the margin of error to four per cent, but astronomers craved still greater precision. Black drops tethering the planet Venus to the Sun’s limb again bedevilled the efforts of 1874 and 1882 transit chasers to establish the exact Earth-Sun distance, despite the availability of bigger, better telescopes and the introduction of photography. It wasn’t until the 2004 transit — long after interplanetary distances had been shaved to millimetre precision via radar signals transmitted from Earth and bounced back by Venus — that astronomers unravelled the twin causes of the dreaded black drop. Half the blame rests on the inevitable blurring of images viewed through a telescope’s lenses. Even the lens of the human eye causes some spreading-out of perceived objects, which constrains an astronomer to peer through two levels of distortion. The Sun plays the other role in causing the black-drop effect. The centre of the Sun’s disk appears much brighter than the peripheral regions — because the Sun is really a round ball, not a flat disk. We see most deeply into its warm depths near the centre, while the light emerging from the perimeter filters through more layers of gas, and darkens accordingly. The extreme edge, or limb, where observers try to descry second and third contacts, looks the darkest of all. So the fault, to paraphrase Shakespeare, lies part in the stars, and part in ourselves. Not only do our eyes deceive us, but each of us has a characteristic response time — a mix of expectation, preparation, anxiety, and attention, not to mention the travel time of nerve impulses through the body. Introspective astronomers of the 19th century studied these effects, and factored the ‘personal equation’ into their observations. 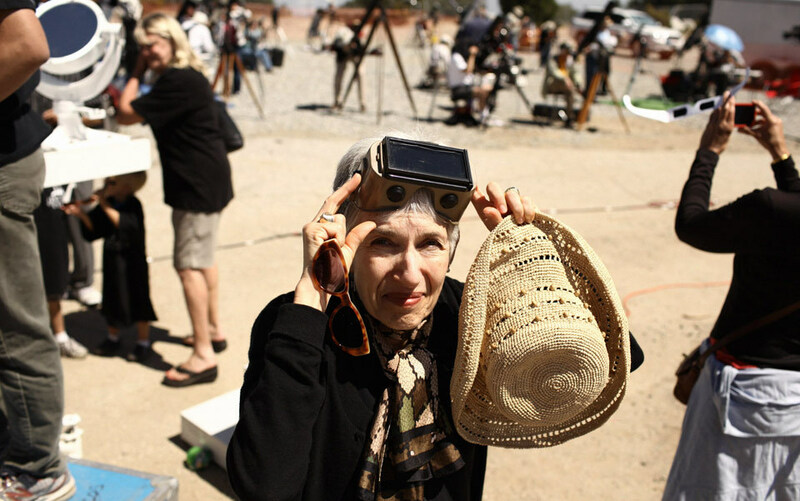 Nothing daunted, several of us on Mount Wilson had downloaded the Transit of Venus phone app, designed to engage the global social network in a citizen-science effort to remeasure the solar system. The free app put many accoutrements of expeditions past in the palm of the hand: a single screen-tap would log in each user’s atomic-clock time of observation and the local GPS coordinates. The app came with built-in black-drop simulations to give users a few practice sessions in confronting ambiguity. Statistics had convinced the app’s designers that the world population of transit observers would divide more or less equally between the trigger-happy and the slow responders. The final data analysis of several thousand tap-reports could be expected to balance all the personal equations. Unfortunately, Wi-Fi failed us on the mountain, so that is where our estimations stayed. Mostly, however, we just gaped. 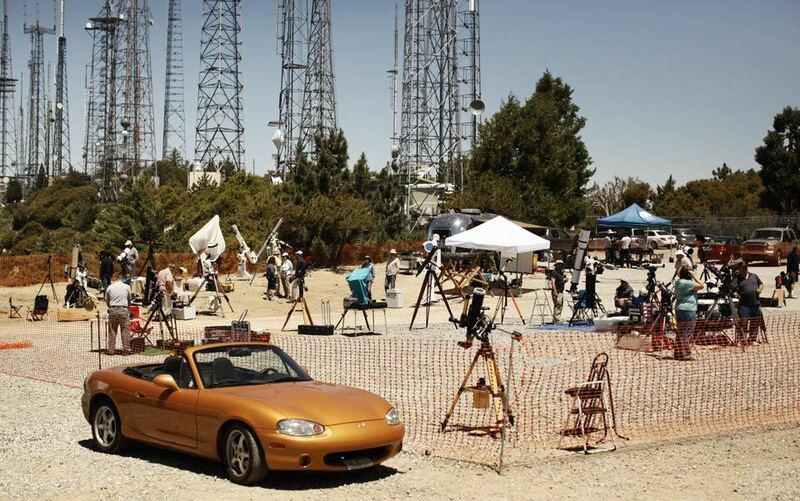 The leisurely pace of the transit and the large gathering of telescopes afforded an abundance of eyefuls. There was Venus on every hand: her passage projected through a grand old telescope onto a big screen for crowd pleasing. Her black body almost three-dimensional as seen through astro-binoculars. Her darkness contrasted with brightness, as a moving beauty mark on the Sun’s face. And the Sun, either blanched of all colour by protective filters, or churning crimson in solar telescopes tuned to the ferment of a star. The observatory shop did a brisk business in eclipse glasses — inexpensive paper frames with aluminised ‘lenses’ to block ultraviolet and infrared radiation. These shades afforded protection for an otherwise naked-eye view. Although I had watched a good chunk of the 2004 transit through just such glasses, I found I could hardly make out Venus through them this time. The passage of eight years might be insignificant astronomically, but counted on a human timescale, from 50-something to 60-something, it produces a marked change in visual perception. A few experienced observers rued another manifestation of ‘poor seeing’, which is astro-speak for atmospheric temperature differences that cause turbulence and rob telescope views of crispness. ‘With seeing like this,’ one visitor from the East complained, ‘I could have stayed home.’ Even the image of the Sun in the 150-foot solar tower was ‘boiling’ around the edges due to seeing effects. But no clouds blocked anyone’s view of the transit and that was cause for joy. Indeed, after the early cries of ‘I see it!’ ‘There it is!’ ‘It’s Venus!’, the general mood settled into a quiet euphoria. How long could we look at variations of an opaque circle on a bright background? Longer than you’d think. Longer than I’d thought. I found it hard to look away, knowing that the sight would soon be gone for good. Pictures of it would abound, I knew, and the myriad pictures I was bound to see later would replace the live view that could be savoured only in these moments, along with the heat and the dust. Toward sunset, the telescopes that had begun the day’s vigil pointing high above Mount Wilson lowered their sights toward the horizon. Seen through added thicknesses of air, Venus jiggled and morphed. The stately pace that had marked her progress since ingress broke into ecstatic dance. In the reddened skies of sunset or sunrise, added layers of air and haze may safely reveal a transit to the naked eye. This happened in 2004 on the east coast of the United States, where folks waited for sun-up to catch the final fraction of that transit. They had feared they would be ‘clouded out’ but, instead, the thin clouds allowed them an ideal view. Where I was in Rome on June 8 that year, the action began well after sunrise and lasted through the peak heat of a cloudless afternoon, and we needed all forms of sun protection in addition to eye protection. One wonders whether the transit of Venus truly remained hidden through all the ages until the 17th century, when improved astronomical tables coincided with the invention of the telescope. It seems at least likely that some keen-sighted ancient, out to welcome the dawn, might have observed a perfectly round blemish on the rising Sun before full daylight swallowed Venus in flames. Mount Wilson turned chill the instant the Sun went down, and observers pulled extra layers of clothing from their backpacks as they stowed their equipment. Three hundred and fifty miles overhead, the Hubble Space Telescope was still watching the transit through an elaborate safety net. The Hubble’s delicate optics rule out looking anywhere near the Sun, let alone at it, so Hubble viewed the transit as reflected off the surface of the Moon. Three on-board instruments parsed the mirrored light in a range of wavelengths from ultraviolet to near infrared, trying to pick out the faint signature of Venus’s atmosphere. During the hours that Venus crossed the Sun, Hubble orbited the Earth four times, losing sight of the Moon for 40 minutes each time around. In another part of the sky, the Kepler spacecraft kept its back to the Sun as usual. Ignoring the transit going on in this Solar System, Kepler continued monitoring its 150,000 target stars suspected of anchoring other solar systems. Kepler aims to discover exoplanets by their transits. Any dip in a target star’s light may signal a ‘candidate’ planet, to be confirmed by further observations. To date, the Kepler team has revisited 2,321 candidates, and conferred bona fide planet status on 74 of those worlds. Kepler is especially seeking small terrestrial exoplanets, the size of Venus or Earth, with an emphasis on Earth-like characteristics such as liquid water and life. One day, thanks to the overall assessments of Venus’s atmosphere gained from this year’s transit, planet hunters will be able to tell a Venus from an Earth in a solar system far from our own. To be able to distinguish, across interstellar distances billions of times the astronomical unit, a Venusian ember ravaged by runaway greenhouse effects from an earthy paradise lush with greenery — this feat would surely prove the long-awaited return on Edmond Halley’s promise.